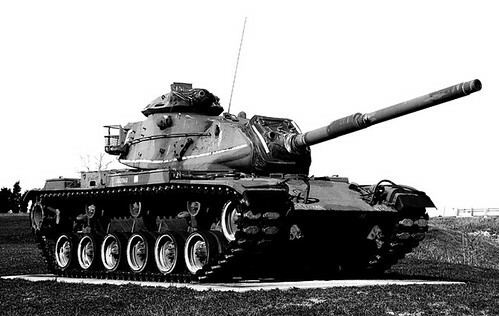 M60 Patton Main Battle Tank, originally uploaded by ElevenTwentySix. In 1957, it was determined that the Soviets were in the process of developing a new medium tank, the T-62, with a 115 mm gun, superior to that of the American M48 tank. In response, an M48 tank was fitted with a new engine and later with a variant of the British 105 mm L7 series gun. This new vehicle (originally designated M68) was put into production in 1959, reclassified as the M60 and entered service in 1960. Over 15,000 M60s were constructed.